Adult horseshoe crabs Limulus polyphemus (L.) feed on a wide variety of infaunal and epifaunal invertebrates during their spring spawning migration in Delaware Bay, New Jersey, USA. Comparison of the gut contents with estimates of available prey showed that the most abundant potential prey item, the bivalve Gemma gemma, was avoided. The thinner shelled but comparatively scarce clam Mulinia lateralis was a preferred prey item. In the laboratory, crabs fed on G. gemma when it was the only available item but not when M. lateralis or soft-shell clams, Mya arenaria, were offered in conjunction. Large M. lateralis (>10mm) were preferred to small M. lateralis; there was no discrimination between M. lateralis and M. arenaria of the same size. 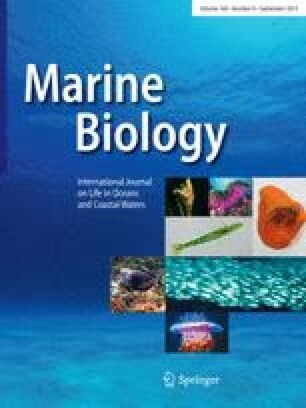 Male and female horseshoe crabs had similar gut contents and laboratory feeding preferences, despite the fact that females are larger than males. Crabs spawning later in the summer contained more food than did crabs collected at the peak of spawning activity.